Harmful emissions that are discharged into the atmosphere are increased when burning high sulfur content diesel fuel. It is therefore, why great efforts are focused on removing this chemical element from Diesel fuels. Additionally, the desulfurization of Diesel fuel allows indsutries to: (1) prevent sulfuric acid corrosion of boiler equipment; (2) re-direct sulphur so that it may be used in the production of other sulfur-containing products; and (3) to restore fuel to a marketable condition. As a component of solid fuel, sulfur may be in the nature of a “sulphate”or a “sulphide.” It can also be found as a component of other organic compounds. For example, coal constitutes a small amount of sulfates. The main problem, with regards to fuel, consists in the removing of pyritic or organic sulfur from the fuel before being used for power the internal combustion engine. The physical methods (e.g. gravity separation) are mostly used to remove sulphur as a sulphide product. The method is quite effective, but only if there are large pieces of sulphides in the fuel. From a technical point of view, it is difficult to desulfurize organic compounds therefore, such processes are mainly carried out only to meet the needs of scientific research. Desulfurization of liquid fuel is performed at oil refineries. When reading and/or researching scientific literature, you will find two main ways of removing sulfur from liquid oil products. One way, known as the indirect way is that a part of the heavy oil residues are processed by vacuum distillation or selective extraction. This process results in light fractions that are processed by hydrogen (hydrogenization). The indirect way of removing sulfur is carried out under specific conditions that include: (1) A temperature of between 375º-500ºС / 707-932 ºF and pressure of 1.4 mPa; and (2) the presence of catalyst agent. The sulfur content in the liquid fuel is reduced by approximately 80% to 95%. It is worth noting that the desulfurization of low-boiling fractions is more effective than that of high-boiling fractions. The other way of removing sulfur is known as the direct way of desulfurization and consists of processing all amounts of the oil with the exception that the light fraction stage is excluded. From a technical point of view, this process is carried out by catalytic hydrogenation at high temperatures. It is clear that the direct method is much more difficult than the indirect one. 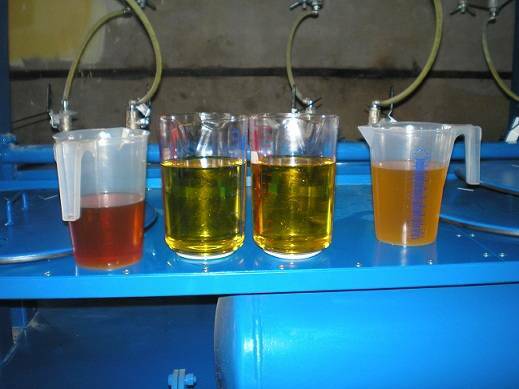 The first difficulty is that the oil contains heavy metals such as iron, nickel and vanadium. These heavy metals settle on the surface of the catalyst agent. It is therefore, the catalyst agent that often needs to be changed. The second difficulty is that there are a lot of heavy particles in the oil fraction that are difficult to hydrogenate. As the temperature increases, the particles turn into coke on the catalyst surface thereby reducing their activity substantially. Operators should monitor if there is hydrogen in the reactor and maintain high pressure in order to prevent such consequences.